For some reason, bad guys like to come after Dr. Ellie Sullivan. This time, she's got a protector in Max Daniels who is determined to keep her safe. 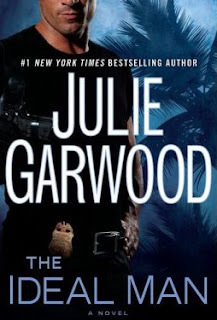 The Ideal Man is heavier on the romance than the suspense, but I don't mean to say that I wasn't hanging on the edge of my seat waiting to see if the bad guys were going down. Though a bit heavy on the perfect characters, the family element adds a nice touch. I loved Max more than Ellie, though she was a likeable character. I can't help that I love rough and tough and he is all that and more. I was pleasantly surprised to discover a complex backstory about his childhood and family, which made him a more well-rounded character. Ellie is a child prodigy, gorgeous, great at her job, and everyone wants her. In other words, she's perfect. Luckily the book scoots past her syrupy sweetness and gets to the good stuff. A memorable line by Max: "Do you mind if I watch 'SportsCenter'? The roundup is coming on soon." He asks before he turns on ESPN? Really?! This is definitely a romantic guy. I'm accustomed to the the guys *cough..my husband...cough* who turn on the TV and turn it straight to ESPN and then look shocked that you might want to watch something else. I had a hard-time putting this one down and loved when Max and Ellie were together for their playful banter. Don't be fooled by the cover and blurb; I recommend this for lovers of romance.